Sofar Sounds – check it out! 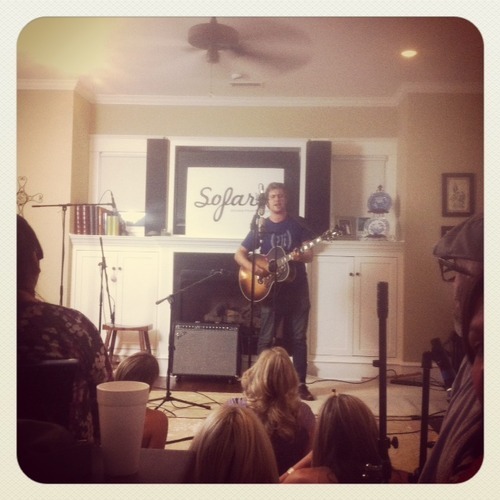 Heard of Sofar Sounds yet? It’s a movement of intimate concerts from a couch and so far they’ve had performances in more than 18 cities around the world. North Texas has a very active chapter and have so far hosted seven secret house concerts in the DFW area! Here’s how it works: you sign up on the Sofar mailing list and get alerted to the next secret show. If the date works for you, simply log your name as someone who desires to attend. If and when your name is drawn, they’ll send you the address of the secret show and you’ll be on the list at the door. Sure, there’s some trust involved. You’re going to a stranger’s house and you don’t know who the artists will be! The reward though is awfully sweet – past artists have included Bobby Long (shown above), Seryn, Salim Nourallah, Air Review, Whiskey Folk Ramblers, Doug Burr among many others. These concerts are small and super intimate. Think 50 or so people in a private home. No clanging beer bottles, no noisy chit chat in the back. These shows are for actual music lovers who appreciate something beyond the typical music experience. Sounds like KXT listeners. The next show is October 13. We know who the artists are and TRUST US – this show will be a treat. Sign up and check it out.